The BlackBerry is traditionally a business tool. 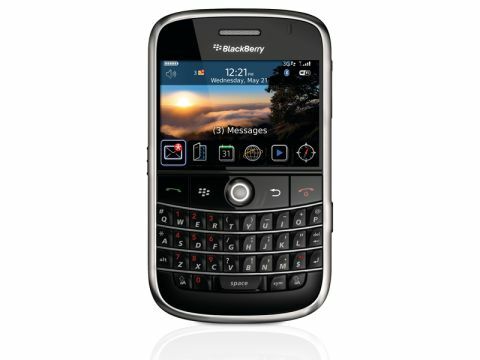 The Pearl and Curve devices were the ﬁrst steps in bringing the BlackBerry out of the ofﬁce and into the hands and pockets of a wider audience. The Bold goes further while retaining the mobile email-based fundamentals of the BlackBerry line. The design is excellent. Its curved corners and black and silver colouring with splashes of red on the keyboard are staid enough not to upset business users, but ﬂashy enough to call out to consumers. The wide format high-resolution screen is superb to look at, and the keyboard is simply one of the best mini-QWERTY types we've used. The keys are quite large, making this a fairly wide device, but they are well differentiated from each other and irregularly shaped, so they are easy to feel individually and they have a good return. A completely redesigned user interface places a row of icons along the bottom of the main screen for shortcuts to your main apps. Press the menu button and the whole screen is ﬁlled with a 6 x 3 grid of more icons. RIM has gone for broke where features are concerned. HSDPA is built in, as is Wi-Fi with support for a, b and g standards. There is a GPS antenna too. BlackBerry Maps help with navigation, though there's nothing to stop you opting for Google Maps if you prefer. The lack of a front-facing camera for two-way video calling and the inclusion of a lowly 2-megapixel main camera are the biggest disappointments. The new menu layout will take a bit of getting used to if you are upsizing from an existing BlackBerry, but the Bold is a solid step in the right direction for RIM.